If you need a car with seven seats, an MPV might seem like the only choice. But plenty of SUVs are also worth considering, especially if you won’t be carrying seven on a daily basis. 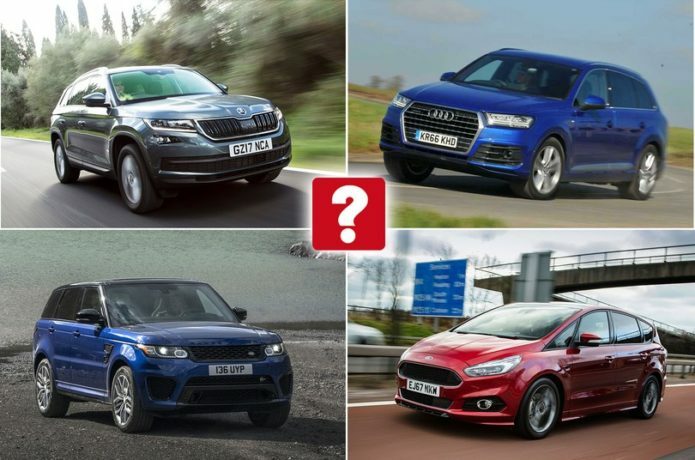 Before deciding which model is best for you, it’s important to consider whether you’ll need a large boot on occasions when all seven seats are in use, whether you prefer the raised driving position of an SUV or something more saloon-like and whether you want something that’s not only practical but also fun to drive. There’s an awful lot to factor in, so here we count down the top 10 seven-seaters – and reveal the ones that are best avoided. A growing family is the reason most people buy an MPV, but the S-Max offers buyers all the necessary practicality in a car that also looks good and is fun to drive. True, the S-Max isn’t as big as the giants of the MPV class – such as the Seat Alhambraand Volkswagen Sharan – but it can still seat seven in reasonable comfort. Citroën has put a lot of thought into the Grand C4 Spacetourer’s interior. Not only can its seats be manipulated easily, the Grand C4 Spacetourer also offers the best visibility of any MPV, making it a doddle to manoeuvre. Our main quibble is that the majority of the car’s features are controlled through an unintuitive touchscreen. But if you can live with that, the Grand C4 Spacetourer represents great family transport. The original Volvo XC90 was on sale for more than a decade and, even at the end of its life, it was still a very practical seven-seater. The good news is that the new version is just as capable and a hell of a lot classier. Its interior quality rivals the premium German manufacturers and, if you pick the right engine and trim combination, you’ll be getting one of the best large SUVs on sale today. Order a taxi to take you to the airport and chances are a Galaxy will turn up – and there’s a reason for that; the Galaxy’s combination of low running costs and brilliant seating flexibility make it a very practical choice. For a tall car, the handling is superb, too, so when it’s just you on board, you can have a lot of fun driving it. The Discovery Sport sits below the full-sized Discovery in the Land Rover range, but still offers seven seats – something that makes it stand out from its key rivals, the Audi Q5 and BMW X3. In addition, all versions have a comfortable interior and are relaxing to drive. By the standards of upmarket SUVs, the Discovery Sport isn’t overly expensive, either. Skoda’s first seven-seater, the Kodiaq, is a comfortable choice with a smart and practical interior, although you do have to be careful when speccing it because it’s easy to push the price north of £30k if you start adding a lot of options. Fortunately, standard equipment includes automatic emergency braking, rear parking sensors, dual-zone climate control and an 8.0in touchscreen infotainment screen with smartphone mirroring. Much like its predecessor, the latest Discovery is a whopping great seven-seater. It represents a big step forward for Land Rover, because it’s more practical than most of its rivals, suitably posh inside and great to drive on and off road. Unlike its fellow French car makers, Peugeot has embraced the increasing demand for SUVs – so much so that it’s turned its family-friendly MPVs into rugged looking SUVs. The 5008 is the larger of the pair (the 3008 is the other). As well as a practical interior with seating for seven, the 5008 has standout styling inside and outside, and it’s even good to drive. In fact, it’s our Large SUV of the Year for 2018. The latest Touran doesn’t really have any major weaknesses. It’s very practical and comfortable, with a high-quality interior. On top of that, the third row of seats are spacious enough to accommodate even tall adults and they stow easily into the boot floor when not in use. All this comes at a reasonable price with decent running costs. In fact, our favourite 1.6-litre diesel model returned an impressive 51.5mpg in our True MPG real-world fuel economy test. The Q7 goes head to head with the BMW X5 and Volvo XC90. And, like those rivals, it has four-wheel drive to gain some off-road ability, but it’s geared towards sure-footed on-road use rather than traversing muddy fields. It’s also an extremely practical car with a generously proportioned interior and huge boot. But what really sets the Q7 apart is its stunning interior, sensational refinement and pillowy ride. The Turismo looks tempting on paper because it undercuts everything of a similar size by thousands of pounds. However, this is one instance where you get what you pay for. Many alternatives have better safety equipment; Ssangyong doesn’t even fit curtain airbags. What’s more, the interior feels cheap, the ride is bouncy and the handling feels ponderous. Mitsubishi’s Outlander PHEV has been a staggering success in the UK because its plug-in hybrid drivetrain means it qualifies for low tax and the Government’s £2500 subsidy to buyers of electric cars. Unfortunately, if you want a seven-seat Outlander, you have to go for the 2.2-litre diesel model, which loses these advantages while keeping the PHEV’s numb steering and unsettled ride.